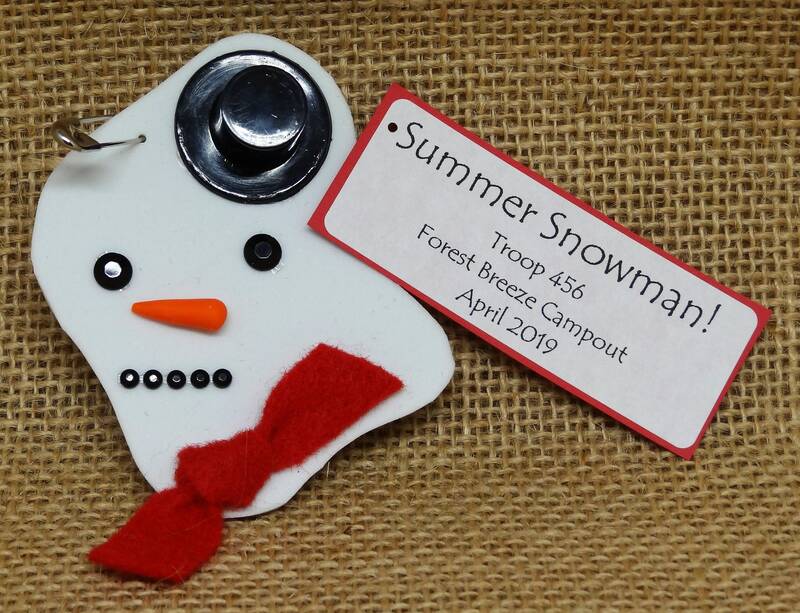 For sale are ten (10) Summer Snowman Scout SWAP or Craft Kits. Oh Boy! This snowman has seen the end of winter, but don't fret! He will be back next year! This SWAP kit contains all the parts for making a traditional snowman: coal black eyes and mouth, carrot nose, red scarf, top hat, melted snow body, safety pin, and personalized tag. Your crafters can cut the shape of the snowman body and place the snowman parts anywhere they want. Each one will look unique! JUST ADD SCISSORS AND GLUE. If you live in a warm climate state like Florida, we can print "Florida Snowman" on the tag. Trade these SWAPs at a winter festival, holiday party, Christmas parade, or with pen-pals in another state. All SWAP kits include FREE personalized tags. Just send us a message with your desired text, and we'll take care of the rest!